Hostel La Cigana (before posada Marco Polo) was born as a need to supply economic clean accommodation for travelers and divers in an outstanding well located 1000 square meters. 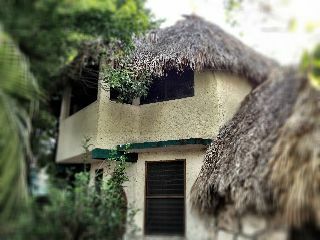 Property downtown Tulum city Mexico. 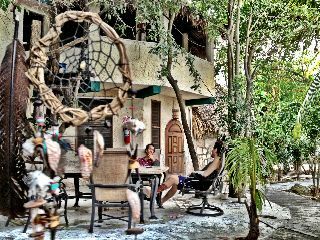 The hostel is Eco friendly decorated by tropical vegetation such as Bugambilia, Cedar Tree, Coconut Pal tree and exotic flowers.Full service Dive center providing since 1993 snorkeling tours (reef & cenote), Cavern and Cave diving, SCUBA training for beginners and experienced divers.Chill out open area in garden with WiFi internet all over the property at no extra cost.Cafeteria open from 8 am to 9 pm providing guests with economic well prepared food services. By bus, if you arrive at Tulum City bus station walk north in the avenue Tulum Zamma direction to Playa Del Carmen five blocks passing Restaurant Don Cafeto turn right at Calle Centauro Sur passing in front of international restaurants Elemental, Le Bistro, la Siesta, next corner you will see the signs for Hostel and Dive Shop.By car, if coming down on highway 307 from Cancun or Playa del Carmen pass intersection to Coba and get to Tulum Town as you get to rojnd about in front of bank Scottia turn left at avenue Satelite, pass two blocks and turn right at street Sol Oriente Drive one street and in the corner with Centauro Sur you will see a property filled with trees and exotic vegetation a rock fence in front of the Bakery La Bahia. Hostel signs to your right.